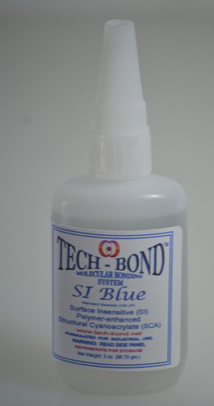 Home > Hobby > Tech-Bond Solutions > Tech-Bond SI Blue Adhesive 2oz. SI Blue is our standard viscosity adhesive and works with a wide array of materials, including; wood, metal, rubber, leather, vinyl, most plastics, china, ceramics, carbon fiber, and composites. You’ll find that SI Blue is simple to apply and is able to handle many materials and projects. We recommend using this product with Tech-Bond Accelerator.